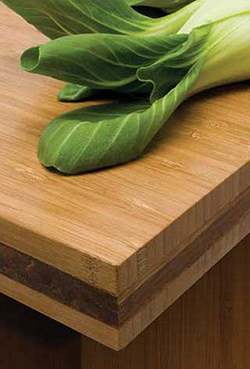 Teragren's Traditional bamboo worktop is ideal for any home or retail d�cor such as kitchen countertops or restaurant table tops. Extremely durable. 40% harder than red oak. The traditional bamboo face with contrasting strand bamboo core provides a beautiful visual accent to any kitchen or bathroom design or other interior application. Prefinished with a food-safe mineral oil/beeswax finish. Also available unfinished.